"After grilling on a gas grill, the shrimp have a great flavor like they were grilled on charcoal. This recipe is also great with scallops (use two skewers so scallops will not roll). 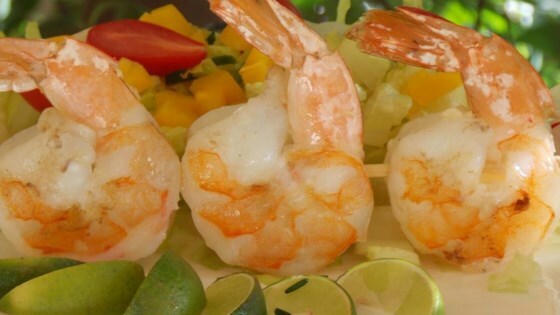 The grilled shrimp and scallops are good by themselves, in pasta, in salads, or fajitas." Soak wooden skewers in water for at least 15 minutes. Preheat grill for medium heat and lightly oil the grate. Chop garlic on a cutting board. Sprinkle kosher salt over salt and with the back of a large knife, smash the garlic on the cutting board to form a paste. Heat garlic paste and olive oil in a skillet over medium-low heat until garlic begins to brown, about 5 minutes. Remove from heat. Skewer about 5 shrimp on each wooden skewer by piercing shrimp through the tail and the upper body. Season shrimp with kosher salt and pepper. Brush one side of the shrimp with garlic-infused olive oil. Place shrimp oil-side down on the preheated grill and brush with more olive oil; cook until shrimp begins to turn pink and curl, about 4 minutes. Turn shrimp over and brush with olive oil again. Continue grilling until shrimp is opaque and pink all over, about 4 minutes more. Delicious, fresh garden herb marinated and grilled shrimp. These need a little help in the flavor department. Lime? paprika? seafood seasoning? Something! They were certainly easy but overall lacking in flavor. Perfection...easy and great tasting. I let the oil cool and then marinated the shrimp in it until I was ready to grill, for maximum flavour. I added some freshly chopped parsley for colour.